Robert Lighthizer: "We are prepared to work continuously to achieve a breakthrough." 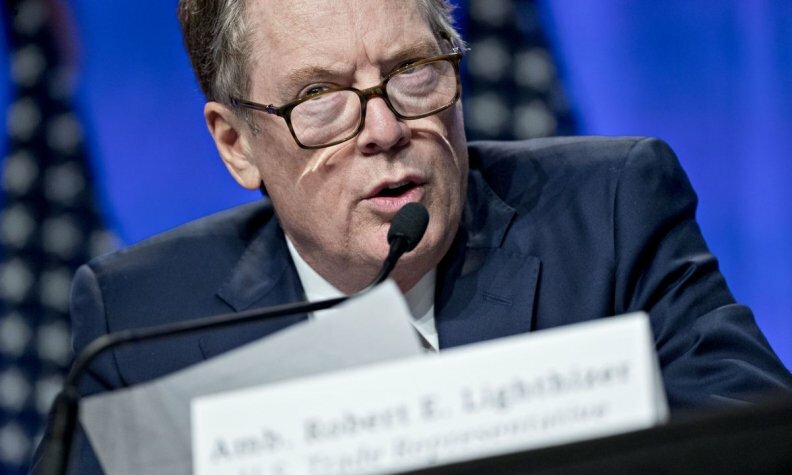 U.S. Trade Representative Robert Lighthizer said the Trump administration has offered to exclude Canada and Mexico from tariffs on steel and aluminum as an incentive to reach a deal on a new NAFTA before a string of elections make it difficult. President Donald Trump's "view was that it makes sense that if we get a successful agreement, to have them be excluded," Lighthizer told reporters in Mexico City on Monday following the seventh round of talks to renegotiate the North American Free Trade Agreement. "It's an incentive to get a deal." Meanwhile, Lighthizer said the U.S. may take a pause in negotiations for the Mexican election in July, if no deal is reached in the near term. "Our time is running very short," Lighthizer said during a ministerial briefing. The tariff threats have cast a pall over talks that are already in overtime. While Canada and Mexico cited agreements on individual chapters as signs of progress, there's no sign of any breakthrough on the most controversial subjects that will be key to reaching a deal to update a pact that Trump has repeatedly threatened to quit. Campaigning will take off next month for Mexican presidential elections scheduled for July 1, and U.S. congressional midterms are set for later this year. "All of these complicates our work," Lighthizer said. In a more conciliatory sign, he avoided some of the harsh language he used at the end of previous rounds. "I feel the longer we proceed, the more political headwinds we will feel," Lighthizer said. "We are prepared to work continuously to achieve a breakthrough." Trump, in a tweet early Monday, first floated the idea of excluding Canada and Mexico from the tariffs if they accept U.S. demands for improving NAFTA. Trump's decision on March 1 to impose a 25 per cent tariff on imported steel and 10 per cent on aluminum caught negotiators off guard in the middle of the talks over the free-trade deal. Canadian Foreign Minister Chrystia Freeland, speaking at the briefing in Mexico City, repeated the threat of retaliation if the White House imposes the duties on its northern neighbor. Mexican Economy Minister Ildefonso Guajardo said it's sensible to exclude Mexico from the tariffs and that his country could respond with trade measures of its own. The White House says Trump and Canadian Prime Minister Justin Trudeau have discussed trade and NAFTA. The White House says Tuesday that the leaders spoke on Monday, and that Trump emphasized his commitment to a North American Free Trade Agreement that is fair to all three countries. The president noted to Trudeau that NAFTA currently leaves the U.S. with a trade deficit. Trudeau told Trump the potential tariffs on Canada are an impediment to a deal on NAFTA, according to a Canadian government official, speaking on condition of anonymity. Commerce Secretary Wilbur Ross and White House National Trade Council Director Peter Navarro both said Sunday that no country will be excluded from the tariffs, which Trump is expected to formally sign as early as this week. Navarro left the door open for corporate exemptions on select cases, without elaborating. The tariffs would hit Canada the hardest of any major trading partner, as it's the largest supplier of both steel and aluminum to the U.S. The Trump administration has defended the need for an across-the-board tariff to stamp out the potential of China, which it blames for market-distorting excess capacity, from diverting its shipments via duty-exempt nations. U.S. House Speaker Paul Ryan rejected the plan for tariffs Monday, in a rare public break from Trump. His office said the action would jeopardize the potential gains from Republican tax cuts enacted this year and that the U.S. economy could suffer. Such a tariff would go against the advice of the U.S. Defense Department, which has argued for a targeted approach to implementing tariffs. Trump is justifying the action under a seldom-used trade law that permits limits on imports for reasons of national security. The president's tariff action complicated efforts to rework NAFTA, which has been yielding little progress on the most contentious issues since the talks started in August. Negotiators have agreed on six topic areas out of about 30 in total, Lighthizer said Monday, adding that progress has been too slow so far but that parties tend to move more quickly toward the end of trade negotiations. The U.S. would prefer hammering out a three-way NAFTA deal with Mexico and Canada, but if those talks fail the Trump administration would consider separate bilateral deals, Lighthizer said. Trump has repeatedly threatened to withdraw from the pact. The NAFTA partners are beginning to make headway on the difficult issues and Canada is "completely committed" to reaching a good NAFTA deal, Freeland said. Guajardo told reporters Monday that "many" more chapters can be closed soon, ranging from telecommunications to financial services and state-owned enterprises. Guajardo downplayed the idea of stopping negotiations for the Mexican election, saying that President Enrique Pena Nieto, whose term ends in December, is willing to stay at the table as long he can to reach a NAFTA deal. Guajardo said he and his counterparts will intensify their dialogue in March with the goal of making as much progress as possible between now and the next negotiating round. No date has been announced for the next session planned for Washington. Lighthizer said nothing was firm, while Freeland and Guajardo publicly said they are looking forward to April talks in Washington. The partners had aimed to complete a deal by the end of this month. Sarah Goldfeder, a former U.S. diplomat and fellow at the Canadian Global Affairs Institute, said no one should discount the amount of work that got done on NAFTA's more mundane chapters. She warned that Trump's moves on steel and aluminum could derail talks. "I fail to understand how Canada and Mexico, with their domestic political pressures, stay at the table with the United States when it's acting like this," she said.